Application to the Early Permanence Quality Mark, or Working Towards Early Permanence, is by this website only – the first step is to Register to Apply. Please ensure your application has the support of senior leaders across the agencies cited in your application. The Moderation Panel will usually meet on a quarterly basis. Forthcoming application deadlines are listed here on the Quality Mark website. Notification of the decision is likely to take approximately 1 month from the next advertised submissions deadline. The first step is to Register to Apply by providing contact information and by creating a password. You may pause and save your application progressively, or complete the application in one go. We will only view the application once you press submit and process payment. The Quality Mark descriptors act as guidance for your answers. Your answers should be unique to your own practice and delivery. You may find the Fostering for Adoption Practice Guide and other tools helpful to refer to when making your application. If your agency does not cover all the sections of the descriptors, do not panic, this is not expected. Use the narrative section to explain this and/or provide a statement of how you view that area of work and its important to the EP process. For example, a VAA or a RAA is not responsible for the child’s journey, but may reference the LA they work with. If you are a single agency or a cluster of agencies (not yet formed as an RAA) please describe the structure in your answers. If you are part of any Early Permanence Network, include this in your application and what it means to your delivery of EP. There is no word limit. Please only include what is relevant to the quality descriptors and your early permanence delivery. PDF or word documents that you wish to supply can be uploaded in the evidence section at the final stage of your application. It is not expected you provide all types of evidence. Be selective. It is important any evidence submitted has direct relevance to Early Permanence and will enable the moderators to make fair and evidence-based decisions on each application. Ensure evidence is clearly named, and referred to via document name, when noted in your answers. Agency data will be helpful to situate your progress in EP. If you choose to supply data, or a case study, please protect all personal identities (please anonymise and be mindful of data protection and GDPR requirements). Agencies in the early stages of early permanence delivery, with a commitment to developing this practice, are encouraged to apply for Working Towards recognition. Your application will be received by an independent convenor for the QM. An independent panel of moderators, leaders in the field of adoption, will view and make decisions. Protocols are in place to ensure the integrity of the assessment system, including confidentiality, data protection (GDPR compliance) and conflict of interest undertakings inherent to the system. 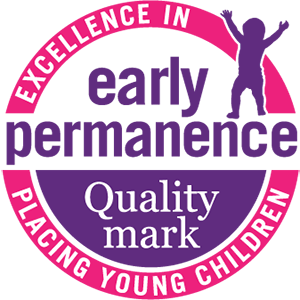 For all queries, email: qualitymark@earlypermanence.org.uk. We aim to respond to queries within 2 working days of receipt.